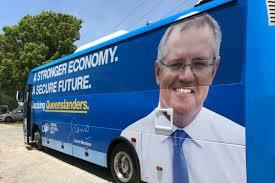 Scott Morrison might have known more about it if he had travelled to North Queensland on board the inappropriately blue-painted bus – blue for Liberals, Cockroaches and Cronulla Sharks – that charged into the region in early November. The bus driver, and nobody else, drove up the Bruce Highway through all the areas that would be blasted by well over 100 fires. If Morrison had gone with the driver, he could have talked about people he got out and met at Bundaberg and then points North. He could have remembered somebody from similar stops at Gladstone, Childers, Gin Gin, Miriam Vale, Mt Larcom, Rockhampton, Koumala, Sarina or Mackay. 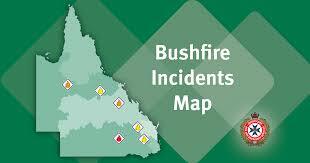 Those and the areas around them, either on the coast like the Deepwater area, or a bit inland like Gracemere near Rockhampton, and the ranges behind Mackay, have been refuge areas for bushfire emergencies nearby or directly in the line of fire. GETTING DOWN AMONG THE FOLKS ON THE GROUND? He might have rung up some of the friends he made on the trip, to see how the government could help them. He could teach them that from his perspective as an advocate for the coal industry their plight would not have anything to do with climate change. To be reasonable and fair he did VIP-jet up to Townsville, to make some announcements, catching up with the bus. “Yeah great little smudge on the horizon down there, your place!”, he might say. WHO IS HANDLING THE CRISIS? 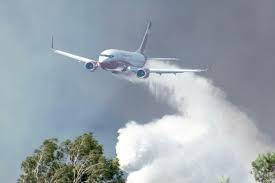 As it happened the Queensland Government, Labor types, had things much in hand, deploying 28 aircraft and a force of 300 firefighters. Under an ongoing exchange deal they brought in relief crews from outside, including New South Wales, Tasmania, Victoria and Western Australia, no impost on the budget. Emergency communications, including clear warnings at times to “get out”, availed the services of the under-threat national broadcaster, ABC, working out well. By the end of a desperate week the State had tallied a worrying but still fairly small number of buildings destroyed, limited losses of livestock, small towns actually saved. One man died working on a fire break and drones were up looking for further damage in bushland areas which have been getting increasingly populated, including squatter settlements not well known outside. Scott Morrison might not have appreciated how they had a woman up there, Anastacia Palaszczuk, doing the talking. But she is the Premier of Queensland, knows people in all the towns and was there heading up the civil defence against the bushfires. By the Saturday they had sent up Michael McCormack from Canberra, as Acting Prime Minister, offering extra relief money. The Queensland government under Palaszczuk has been prioritising action against effects of climate change in government strategies, and has had to make a habit of dealing with natural disasters: floods, the fires, denudation of the Great Barrier Reef, even another cyclone that was threatening to form off the coast. Linkage between the extreme weather and long-term climate change is not much doubted by folks on the ground dealing with each new shock as it comes along. That link has also been attested to by the Climate Council , the leading scientists’ panel formed after the Abbott – Turnbull Governments scrapped the official agency they were sitting on. For over two years they have been linking climate change to the once-upon-a-time-unlikely phenomenon of major bushfires in Queensland. Under historical weather patterns, in Northern Australia it rains in Summer, so you do not get the savage burns that occur in the South, where it rains in Winter and becomes inflammable – hot and dry – during the Summer. 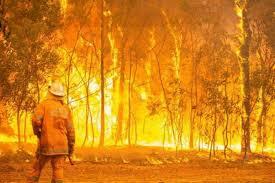 Now the weather is getting upside-down and inside-out, Queensland has this rash of unprecedented fires, taking place in record, abnormal heat for November and early December.